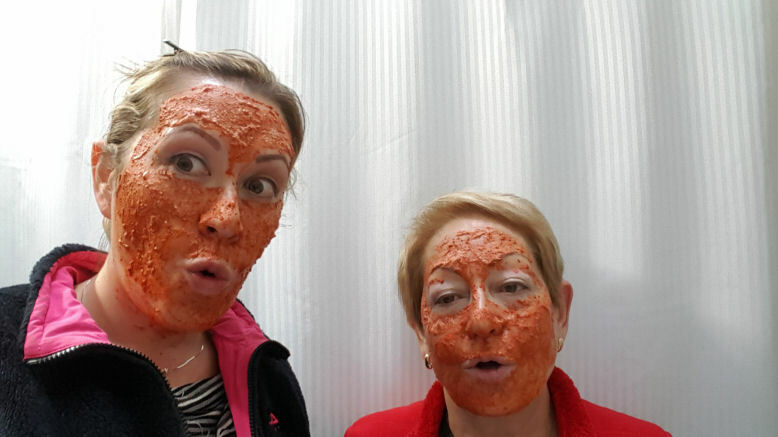 Most face masks with all natural ingredients are good for your skin. They tighten and firm the skin, brighten face too. 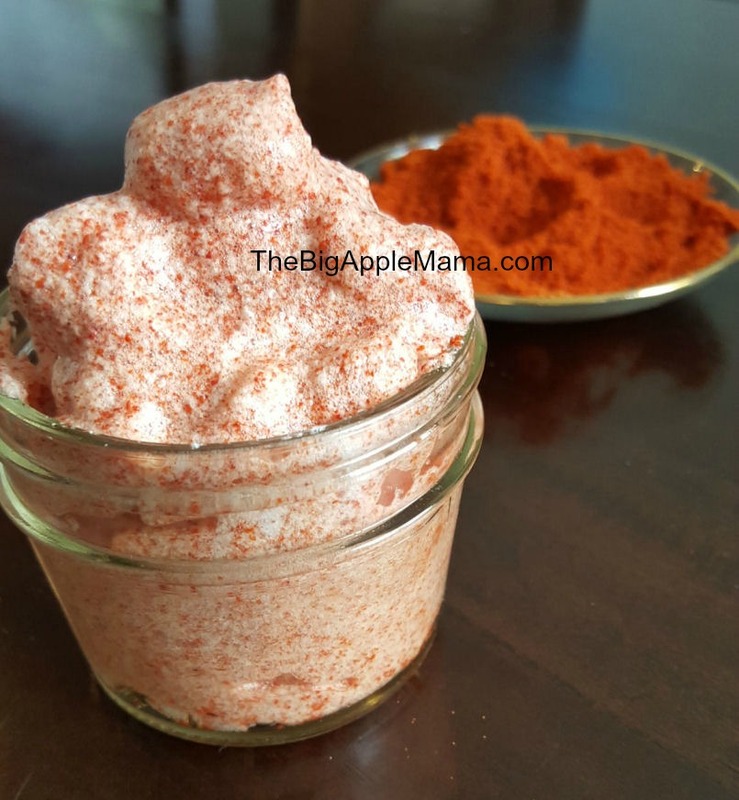 There’s no need to buy those expensive beauty treatment at the drugstore when in just a few minutes you can whip up your own all natural beauty mask that will give your skin a boost of moisture and help prevent fine lines and wrinkles. Plus all those creams and beauty treatments from drugstores are primarily loaded with chemicals and toxins that are not good for you and your skin and they simply don’t work. The companies make you think that they work, but they don’t. I remember about 2 years ago after I quit using drug store facial moisturizers and replaced them with Coconut oil or other types of oils (like Argan and Rosehip oils for example), it improved my overall appearance of the skin and it became more glow-y and healthier looking. If you look for those oil, just try to look for organic. Today I wanted to tell you about this wonderful face mask that serves as a face mask AND the body scrub! This facial mask recipe is so easy and SO GOOD for your skin. It brightens face, cleans and shrinks pores, it’s anti-bacterial, anti-fungal, reduces aging, anti-cancer, anti-inflammatory, with 70% more antioxidants, full of fiber and much more! This face mask uses only 2 ingredients. Two organic ingredients! Another good part that this face mask becomes an excellent facial and body scrub. I will tell you both methods how to use it. 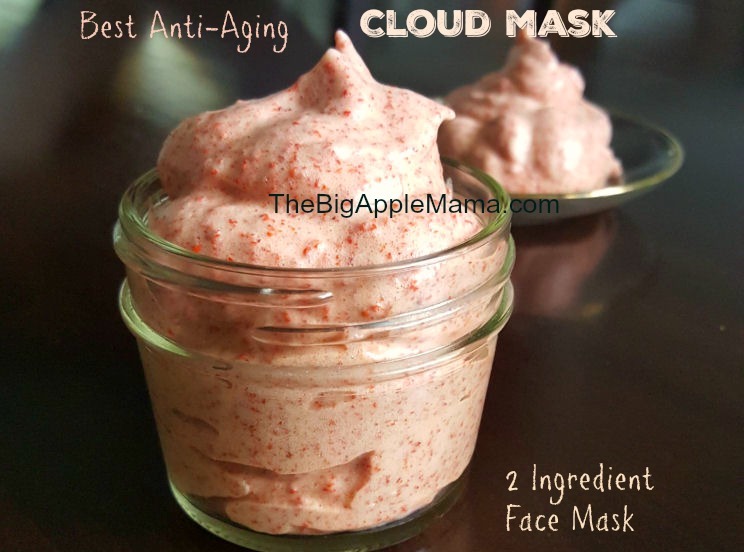 I like to call this mask – Cloud Mask (because from the photo above doesn’t it look like a cloud in a jar? 🙂 It is very lightweight and fluffy! 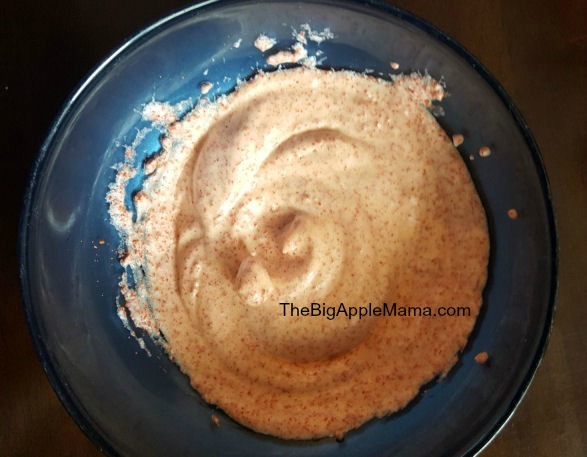 1-2 tsp Avocado seed powder – in this post I tell you how to eat and grind your avocado seed. Do not throw it away. That’s it! You’re done! these are the 2 main key ingredients! Mind blown, right? Now I tell you how to prepare your Cloud face mask. Separate the egg white from egg yolk – for this recipe you only need the egg white. Beat the egg white using your mixer until it becomes fluffy consistency, forms a peak and holds it’s peak (about 2 minutes for 1 egg white). It should look something like on the photo above. Add 1 or 2 tsp of your avocado seed powder. 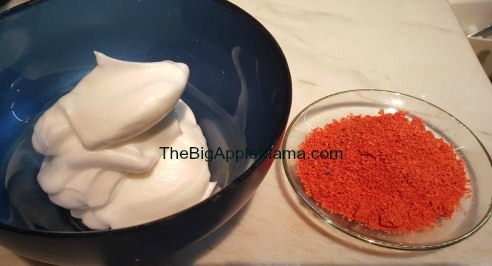 In this post I show you the video how to turn your avocado seed into a powder and how to store it. Gently mix 2 ingredients together. At this time your Cloud mask should look like this. You can start applying to your face and neck immediately. I suggest to do it over your bathroom sink just in case few pieces will drop. There is a ton of mixture and this recipe is good for 3 or 4 people. Keep piling up the mixture to your every piece of face, under eyes, around eyes. It is safe for ALL OVER. It will not burn or sting for a second. I love that this mask will apply easily and nicely and once you done piling up the mixture to your face it will STAY and will keep hardening. Set the timer for 20 minutes and go do whatever you need to do because this mask will stay put. This is how my mask look. Once applied you will feel it start working right away and tightening your face. After 20 minutes has passed you will feel the mask got harder. Go to your bathroom sink and remove the mask with the help of your fingertips and running warm water. Your sink may be a little pink. Don’t worry, the mixture will not stain the sink, instead it is good for your drain. After you remove the mask you can see the results immediately and in front of your own eyes. Your pores will look clean, your face is smooth, fine lines may disappear. At this point your face is super smooth and silky and tight. You may feel that it is too tight and now it’s ready for a good moisturizer. I like to moisturize it with coconut oil. You can even feel that the face is “so hungry for moisture” it will start absorbing the moisturizer the second you put it on. I LOVE this mask so much. Although my mom tells me not to use it every day, I feel that it can totally be used every day. It doesn’t do any damage, instead it only does good things. But my mom tells me that usually people use masks like once or twice a week? I may disagree with her, because if I eat eggs and avocado every day, so why not feed your skin eggs and avocado every day. Well, this is just my opinion. Ok, now I tell you the second method, how my friend makes this mixture. Same ingredients as above – 1 egg white and 2-3 tsp avocado seed and she blends it. My friend (who originally introduced me to this face mask) has a Ninja bullet blender and she blends it to a creamy smooth consistency and then applies the mask to the face. I tried her method. It is much thinner than the first method (Cloud Mask) it may be a little runny when you apply the mask to your face, but the results are the same. Once you’re done applying the mask, it should stay put and will keep hardening so you don’t have to worry about the drips. Because the ingredients are fresh, I recommend using it at once. However you can store it in refrigerator for up to 7 days. Keep in mind, though, that egg white fluffiness will de-fluff and the mixture may become liquid-y. You can also use the same mixture as a wonderful body scrub. Once avocado seed powder gets in contact with other moist product (egg white in our case), it creates tiny particles that are excellent for exfoliating. Jump in the shower and put the mixture all over you body for a wonderful body scrub. 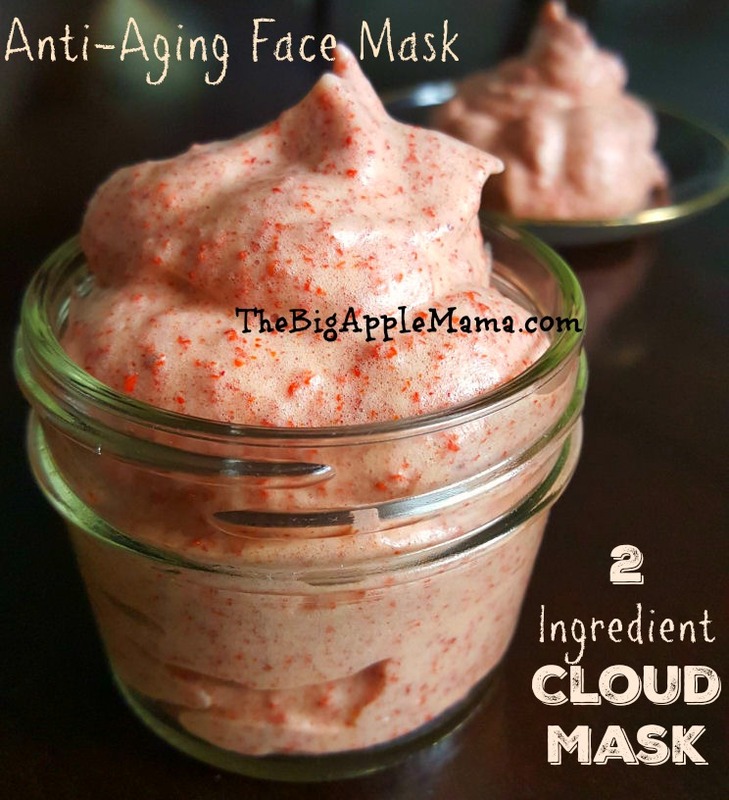 Let me know if you’re going to give this Cloud Face Mask a try and how you are enjoying it? Do you know someone who’s looking for DIY organic face masks that work and that would love to make this, please feel free to share this recipe with them! I would love to see how yours came out! Please feel free to post your photos to my Facebook Page. Good luck. How amazing!! I can not wait to try this! same trick, but just whipped eggwhites. That was in the 1960’s. Nice mask. This sounds soo interesting! I am going to try it! I found it didn’t keep well after one use but could be used later even though it lost its fluff. I agree wt your mom…to use only once or twice a week. Of course we can eat them everyday but if you pull your skin everyday…instead of making skin more elastic n supple..it might actually cause more wrinkles n sagging…just saying ?